Armenelos - The race of Men (Edain) who would become the Númenóreans in the Second Age departed Middle Earth and sailed to a land prepared for them by the Valar. It was a large island in the middle of the Sundering Sea, and they were led by a star (Rothinzil) which stood alone in the Western sky. 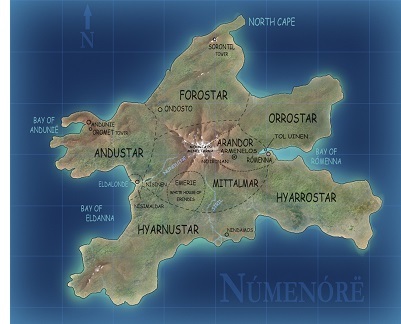 The Númenóreans were unique among Men in that they had Elven blood mingled with their own as a result of Elros, the Half-elven, choosing a mortal life and becoming their first king. Because of this, they were fairer and longer-lived than other Men of Middle Earth. And they built for themselves a glorious city which became their capital.